Nox Medical has released a new Chain of Custody solution with an innovative Single Body Source analysis in Noxturnal 5.2. 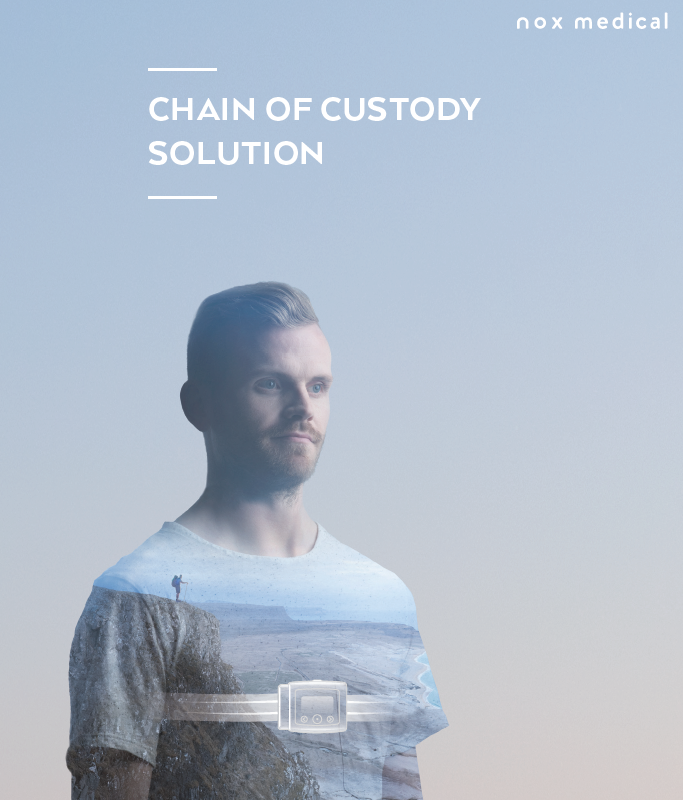 This solution is released to meet the increased need for a Chain of Custody solution in some markets. The purpose of a Chain of Custody solution is to help confirm the identity of the person who is intended to undergo a sleep study. Nox Medical’s Chain of Custody solution is designed to balance the clinician’s need for a secure Chain of Custody solution with the patient’s need for a comfortable home sleep testing solution. It uses advanced automatic algorithms, coupled with a simple, low-cost, bracelet to fulfill these needs. In short, Nox Medical’s Chain of Custody solution involves the system’s pulse oximeter to be attached to the patient with a non removable tamper-proof bracelet. Then, during the study download from the device, the Nox Medical patent pending Single Body Source algorithm, uses the patient’s own biosignals to give a clinician the data needed to verify the chain of custody. This is done by correlating the biosignals from the Nox T3 and the securely fastened pulse oximeter. In the case of the Single Body Source analysis detecting any deviations from the chain of custody, the Noxturnal analysis software will indicate an inconclusive status for the chain of custody, thereby allowing the clinician to manually assess the biosignals and potentially redoing the study. Otherwise, the Noxturnal analysis software will indicate a secure chain of custody. Why Chain of Custody Solution? Chain of Custody solutions have already become a requirement for those providing an HST solution for sleep diagnostics. This will become even more vital if the demand for HSTs becomes higher, as is the trend in most countries. Helping payers, clinicians and patients with a good chain of custody solution is vital to keep the integrity of HST solution, whatever the device. Manufacturers need to play a vital role in making HST reliable and effective with growing demand for sleep diagnostics. Chain of Custody plays an important role in this.